The garbanzo beans in the recipe are sprouted, which some experts say make them easier to digest and that they offer more of their naturally occurring nutrients than when cooked. 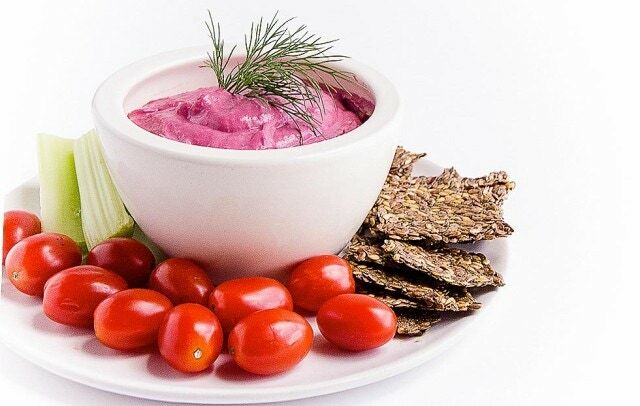 One thing is certain, this unique take on hummus tastes great and is a super healthy snack, appetizer or sandwich spread. Start by soaking the garbanzo beans in water for at least 12 hours and up to 24 hours. Put the garbanzo beans in a cheesecloth sack. Over the next 24 hours, rinse thoroughly every 3–4 hours. The sprouts will start to appear like tails. Stop rinsing when they get to about 5 mm long and store in a lidded glass jar in the fridge. You can learn more about sprouting here. Preheat oven to 400°F. Wash and peel the beet and place it in a small baking dish with ¼ cup of water and transfer to the oven for 45 minutes. Take beet out of the oven and allow it to cool. Add all ingredients to a blender or food processor on high speed until you get a desired consistency. Store in a seal-tight container in the fridge for 1 week.